This Romantic etching is an intense depiction of hallucinatory artistic inspiration. The psychology of the artist’s mind is represented in this Romanticised portrait. 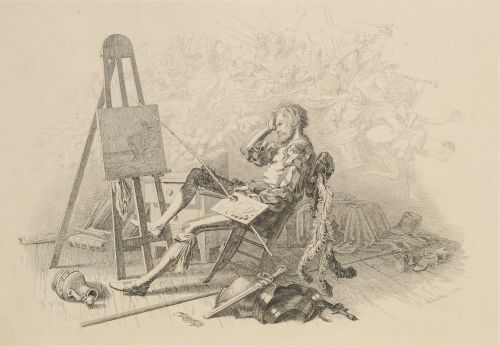 This image shows the artist Emil Theodor Richter (1801-1877) at his easel. The artist sits slumped at his easel, while a disorderly crowd invented by his imagination fills the backdrop. The title suggests that Richter is preoccupied, or even tormented, by memories of merrymaking the night before. A plethora of objects strewn along the floor symbolise the disarray of Richter’s mental state. By depicting Richter in historical dress and inserting exaggerated dreamlike characters into the image, Neuereuther follows a strong contemporary German fashion for taking creative inspiration from poetry and fairy tales.